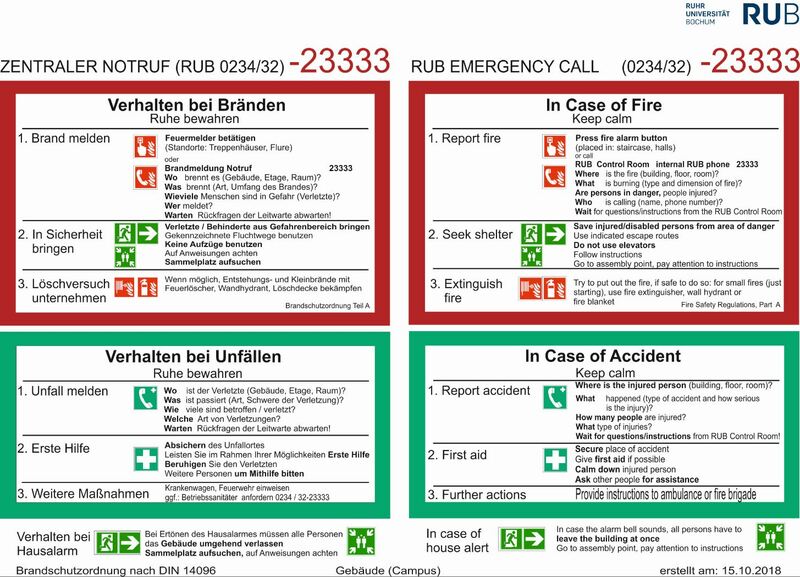 On this webpage, the Ruhr-Universität Bochum will post up-to-date information regarding on-going emergencies on campus. Currently, no emergency has been reported. All emergency calls should be made to the Ruhr-Universität Bochum Control Room! Depending on which type of emergency has occurred, the Control Room staff will call the according emergency service for you. The RUB Control Room is available 24/7. Leitwarte (RUB Control Room). 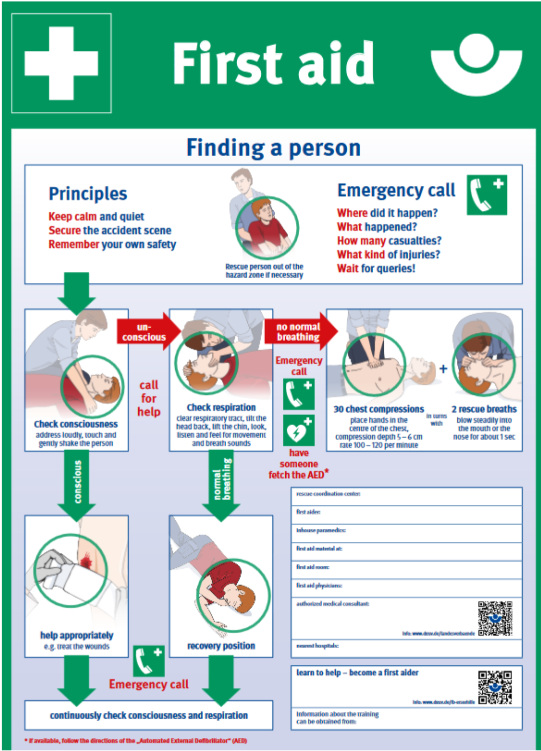 Please also use this number when there is need for access to a Shock Advisory Defibrillator. The RUB security staff is located at the „Infopunkt Uni-Mitte“ (information desk Uni-Mitte). This information desk is available 24/7. The “Infopunkt Uni-Mitte” is located underneath the UV building close to the RUB bus stop and the RUB visitors’ parking area. This phone number can also be used to arrange escorts for personal protection, e.g. at nighttime to get to a RUB carpark and/or train (U35). The following link leads to a table of “Durchgangsärzte” in Bochum. A “Durchgangsarzt” is a doctor who you have to consult if you were injured due to an accident at the Ruhr-Universität Bochum. Above the table there is a link which will provide addresses of “Durchgangsärzte” where you live. For less critical or less urgent technical issues, please use the online helpdesk tool provided by department 5.I (Dezernat 5.I, RUB-Facility Management). Please note: this website is currently only available in German. For information regarding the topics above, please follow the according weblinks. Please note: some of these websites are currently only available in German. For information regarding the topics above, please follow the according web links. Please note: some of these websites or services are currently only available in German.